Giant Hogweed, whose botanical name is Heracleum Mantegazzianum, is an invasive plant that spreads rapidly from woods and wild areas. With small white flowers that make little domed or flat umbrella shapes called umbels, the giant hogweed’s stems are green and bristly, sometimes with purple blotches. A close relative of cow parsley – condemned as the countryside killer by the Independent – giant hogweed is an imposing sight when fully grown. The plant originates from North-Western Asia and is a UK non-native – when left alone, they can survive for up to 15 years. Giant hogweed is classed as an ‘invasive alien’, and as such it is an offence to cause giant hogweed to grow in the wild, and some landowners have even been presented with an Anti-Social Behaviour Order and ordered to remove the weed or face penalties. Often local authorities will take action and remove this stubborn plant from public areas. The sap from a giant hogweed plant can cause skin burns on contact, so many gardeners decide to have it removed to avoid accidents. Giant hogweed contains high levels of furanocoumarins, a chemical that can cause burning when skin is exposed to sunlight, as well as other skin complaints. This also makes it particularly dangerous to animals who’re unaware of the harm the plant can cause them and as such don’t avoid it. Children are known to be particularly sensitive to the sap, and can as such suffer with bad reactions. Just like humans, the sap causes burns and other skin problems when it comes into contact with skin (or fur) of an animal, but it is also poisonous when ingested. Animals are particularly sensitive to eye damage, and if the sap from a giant hogweed plant comes in to contact with your dogs’ eyes it can lead to permanent scarring of the eyes or cloudiness of the corneas. This can inevitably lead to loss of eye sight. Giant hogweed removal can be done in two way: non-chemical, and chemical. Non-chemical means removing the plant from all affected areas, or sometimes suppressing with mulch. Attempting to control or remove giant hogweed when ill equipped or ill prepared will inevitably cause harm. All skin should be covered, and masks should be worn when working on or near it. The debris of cut plants and clothes that have been contaminated are just as dangerous as the plant whilst in the ground. As giant hogweed is attracted to moist soil near waterways, you should never allow a chemical weed killer to enter a waterway if removing the plant from close to the water. If it looks like this will happen, hire a knowledgeable professional, who will likely contact the Environment Agency. 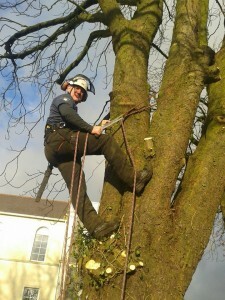 Although some gardeners choose to tackle it themselves, we wouldn’t recommend this and instead suggest you get in a professional such as Complete Tree Care. This is because the sap can cause photosensitivity on the skin, which can lead to painful blisters when exposed to sunlight. To prevent injury and ensure the plant is handled in the best way, a expert should be used. 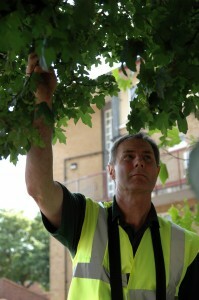 At Complete Tree Care we have been providing a reliable and knowledgeable service for 15 years throughout London. No job is too large or small, we’re local authority approved and we can help you today. Call 020 8616 9051 or fill out our contact form on the right for advice and bookings now.